As a pool owner, you probably do everything you can to make your pool area look great. You’ve got the perfect deck or cement surroundings, and maybe you even have your lounge chairs lined up just right. But then there’s the pump and filter. They’re big and unsightly and if they’re installed right by your pool, they totally ruin the aesthetics of your yard. But that’s not the only reason people cover them. There are also elements like rain, high winds or flying debris that can damage it. And some people like to add a sound barrier to the noise. So, how do you hide them? Well, there are three basic types of pool enclosures: boxes, pump houses and walls. But within those categories, there is lots of room to get as creative or keep it as simple as you want. Which one you choose depends on your particular taste, the amount of time you want to spend, and your budget. Buy Them Or Build Them? It’s a good idea to use a box if you want to protect your pump and filter from rain and snow: they offer more protection than other types of enclosures because they completely enclose the equipment. Usually a box will have a hinged lid so that you can get to the pump to service it. They also usually have some type of slats or openings to provide proper ventilation. 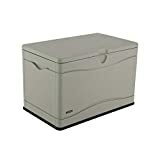 It has a hinged lid that is lockable and has a spring hinge for safe and gentle closing, and is also covered by a 10-year manufacturer warranty. These are probably the most common types of equipment covers because they're the simplest to make or install: you simply surround the equipment with a wall, fence or screen. Lots of people use fencing material that matches the fencing around their yard, but there is lots of room for creativity here. This decorative screen will conceal all your pool equipment or anything else you want to hide stylishly. It’s made out of a long lasting resin wicker, but has a very natural element look, and is secured into the ground with steel stakes to keep it stable. Pump houses are kind of the high end of pool equipment covers. Usually, they combine seating or storage space along with covering the pump and filter. They're usually larger enclosures and most can be open from the front, the top, or both. A lot of people also choose to enclose their pool equipment with full-size garden sheds. This way, they do double duty as storage. This one from Keter does come in a couple of different sizes, but it’s a fairly small garden shed that won’t take up the whole back yard. It’s made out of polypropylene resin plastic and reinforced with steel for maximum durability, but it has the look and texture of wood. Before you go get all crazy with the power tools, you might want to know there are a lot of options available to buy. And since most of them are not too expensive, I recommend checking around to see if there’s one that meets your needs that you can buy. You can find wood, plastic, mesh, and metal enclosures. And they even make some that look like big rocks. However, if there's a particular look you are after or if you just happen to already have the materials, you might decide to build it yourself. Most are not too difficult to build and this way, you can customize the size, materials and functionality to meet your needs. You don’t have to soundproof your cover if the noise doesn’t bother you, but some people like to buffer the sound a little bit for themselves and even the neighbors. Your pool equipment doesn’t have to be covered if it doesn’t bother you; it’s made to be outdoors and should be able to withstand most conditions. If you do have extreme weather conditions very often, though, like lots of rain or snow, you might want to consider covering it to make it last longer. But the type of cover you choose to buy or build is up to you. Add a function to it like storage or seating, or cover it with a big fake plastic rock. The choices really are limitless.